I’ve recovered, from a 3 week TDF2015 sleep deficit and some flu that’s going round at work, sufficiently to write my first blog for August 2015. The final mountain stage #20 of the TDF 2015 an absolute cracker, as the promised show down between the GC contenders on the iconic climb of Alpe d’Huez actually happened. The talk matched the walk…er…ride. The one-two move of Movistar’s Alejandro Valverde and Nairo Quintana very nearly broke the Sky Train and Chris Froom’s grip on the Jeune Malliot. When the heat was on Sky rallied behind their leader. Richie Porte and Wouter Poels should take a big bow for dragging Froome up the final 10km of Alpe d’Huez and onto the podium in Paris. The short but brutal stage #20 must have seemed interminable to the riders as they struggled their way up the final climb. The crowds on Alpe d’Huez were as large as ever – some say one million fans lined the roads – but despite concerns over out-of-control spectators causing bother, trouble did not really materialise. I sure French fans would have taken some heart from the fine stage win by the French FDJ rider Thibaut Pinot. So here’s another couple of pilfered photos of GC and Jersey for the TDF 2015 podium. So before signing off, congratulations should be given to Adam Hansen who finished his 12th consecutive grand tour, despite dislocating his shoulder back in stage 2. Dear God the man feels no pain. 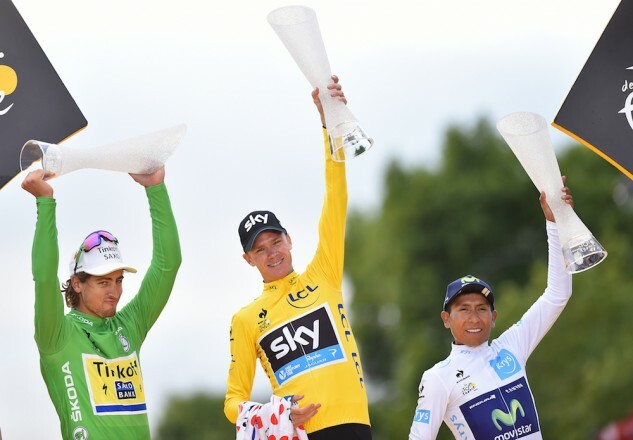 This entry was posted in Grand Tour, UCI Events and tagged Adam Hansen, Alejandro Valverde, Alpe d'Huez, Chris Froome, Nairo Quintana, Peter Sagan, Richie Porte, Thibaut Pinot, tour de france, Wouter Poels on August 3, 2015 by Marv.